Producer Ben Finley gives a behind-the-scenes look at AC360's set in Las Vegas the night before CNN's GOP debate. Anderson Cooper moderates on Tuesday, Oct. 18 at 8 p.m. ET. View photos of Anderson and the AC360° team preparing for the debate. 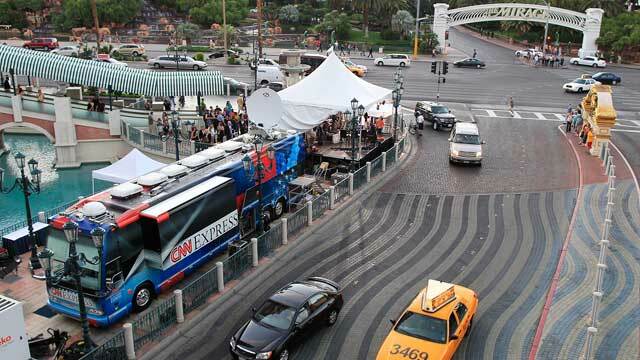 Anderson and the Anderson Cooper 360° crew are in Las Vegas preparing for tonight's Republican presidential debate. View the photo gallery for a sneak peak, and join us at 8 p.m. ET when the candidates take the stage with Anderson moderating the discussion. If you submit your questions to CNN, they may be asked at the debate! You can also submit them on the CNN Politics fan page on Facebook and by using #CNNDebate on Twitter. Editor's note: CNN's Anderson Cooper speaks to one of his producers about booking guests for his show. Editor's note: Tune in to "Hope Survives: 30 Years of AIDS," an AC360° beginning 9pm ET Friday. Greater Than AIDS – a new national movement to respond to AIDS in America– is asking Americans to share their “Deciding Moments," personal experiences that changed how they think about the disease and inspired them to get involved. For many it is someone close to them who was infected. For some it was their own diagnosis. For others it was a realization that we all have a role to play. Tell us about your “Deciding Moment” by visiting: www.greaterthan.org/moment. (CNN) - When AC360°’s editorial department was first approached a few months back about producing the 9pm hour during the first two weeks of January, I must admit the initial reaction was one of mild panic. Not only were we already producing our normal time slot at 10pm ET, but now we’d be responsible for a second hour, with a completely different show. To raise that bar even higher, the holidays were rapidly approaching and the two-week period of the year where even cockroaches are on hiatus from the daily hubbub of New York City life was about to begin. How on Earth would we pull this off? Despite the hurdles before us, we began to view this as a great opportunity to think outside the box and generate some really new and fantastic ideas for our viewers. I began to think about the year 2011 and what events or moments in history would be having an anniversary. Having worked on HIV/AIDS projects in the past, it dawned on me that this would indeed be the 30th year since the first diagnosis of HIV/AIDS in America. It is almost too hard to believe that three decades of a disease that has defined my generation have really passed before our eyes. I thought to myself: How could we NOT spend at least one of our shows looking into this incredibly long journey, the stigmas still surrounding this disease, and why it is that we still do not have a cure? After reaching out to a handful of individuals who could speak best to the legacy of this terrible disease, my first response was a resounding yes from Sir Elton John. For those who might not realize it, 20 years ago, Elton John became quite active with HIV/AIDS awareness after being inspired by a young, HIV positive hemophiliac named Ryan White. It was then that he created the Elton John AIDS Foundation and began trying to generate greater public awareness and better understanding about how to fight the stigmas surrounding HIV/AIDS.